The difference between a hairstylist and a barber. 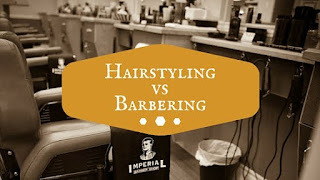 Many find themselves confused when differentiating between a barber and a hairstylist. In the Traditional sense and based on 30 years of experience and education I believe that there was and still is a distinct difference. As a hairstylist, the focus is largely on promoting current trends and styles by either cutting, colouring or chemically waving hair. Often it is about manipulating hair to the desired look. The use of styling products such as creams, gels and sprays are usually necessary to achieve the desired effects. You may compare it to clothing designers or fashion consultants. Your visit can be about transforming your look for something new. Barbering on the other hand, is largely about grooming, removing hair, with specialization in shaving , trimming and cutting. There is no expectation of changing the look but more about maintaining what is usual. However, today's Barbers have proven to be leaders in creating haircut styles using some of the most advanced cutting techniques. The tools are quite different. The blades on barbering shears are twice as long, they allow barbers to be efficient in cutting hair without holding it with their fingers. Services are performed in a much shorter time and customers usually return every 2 to 4 weeks. Barbers focus largely on the directional growth of hair which ultimately determines the natural way hair falls and promotes the longevity of a style.